Home Farm Plants (Bovingdon) is a small traditional family run nursery growing a wide range of perennials, P.Y.O. seasonal cut flowers and Elatum Delphiniums. We also provide a hanging basket service. Nothing is grown under false conditions, everything is hardened off or grown in natural conditions before being sold. We open from April 1st to the end of October, however this is subject to weather conditions. Monday to Thursday viewing is by appointment. Please call us and we will be happy to arrange an appointment for you. 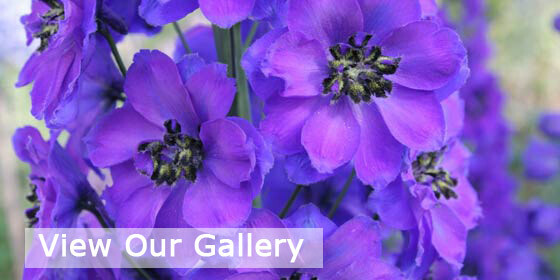 At Home Farm Plants (Bovingdon) we are passionate about Delphiniums and have built up a specialist Delphinium section. Our Delphiniums are the Elatum species which are tough, hardy perennials. They can withstand very cold winter temperatures and are reliable garden perennials. We not only have the traditional blues, but different shades of pinks, purples, white and cream, all flowering from the end of May through to September, on the nursery for you to see.